New Plymouth Airport is the first regional airport in New Zealand to have a second terminal building, as Jetstar Airways prepares for its inaugural flight to arrive from Auckland on Monday. 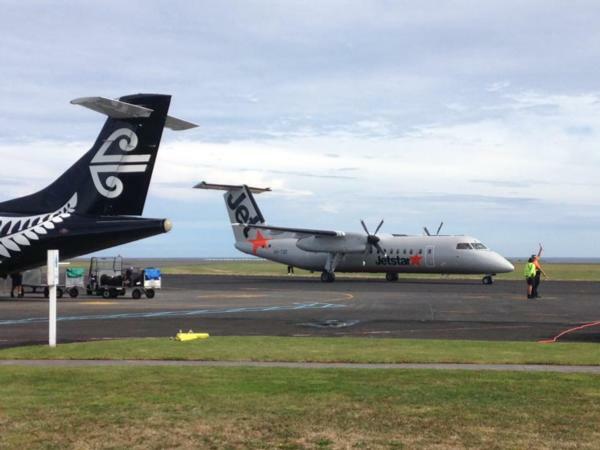 “The custom construction of the site has taken two months,” New Plymouth Airport manager Kevin Hill said. In his 10 years in New Plymouth, Hill said New Plymouth Airport had jumped from 16th busiest airport in New Zealand to 9th place last year. "Passenger numbers have grown from 187,000 ten years ago, to around 342,000 last year. "The growth has been quite phenomenal," he said. "And of course that's good for the region, good for the city and we've got to continue to grow it." New Plymouth Airport’s second terminal building was made specifically for Jetstar, while the main terminal building is upgraded in size by more than 50%. Hill said they had longer term development goals for the airport including opening up more space where planes could park up, to increase the capacity for flights coming and going. Currently the airport could accommodate four airplanes on the apron, but more space would be able to cater for things like delayed flights due to weather conditions, Hill said. Jetstar’s first commercial flight arrives in New Plymouth from Auckland on Monday at 9.50am, with a flight to Auckland departing at 11.50am, expected to hold mostly invited VIP guests. The Jetstar launch ceremony kicks off at about 9.30am from the airport’s second terminal, Jetstar Terminal 2. All members of the public are welcome to attend, as the event will be a moment not to be missed, Jetstar representatives say. A community advocate who focused on getting the airline into the region and a Jetstar VIP Michael Riley said the launch will be about letting the public see the services kick off. Riley would be a passenger on board the first flight to Auckland from New Plymouth. New Plymouth Airport has a busy time ahead as million dollar upgrades begin to also start on Monday for the main terminal building. Designs show a massive overhaul of the entire airport, including improved security and a designated ‘Customs Security’ site, for possible future international flights. The airport will also have a new shop added to it. The baggage claim is set to be upgraded on a large scale, designs show. Jetstar will service New Plymouth Airport with four daily scheduled flights, totaling 8 flights in and out of the airport on a daily basis. Flights range in price from $19 to $45 with Jetstar while Air New Zealand flight prices range above $39.